This article will focus on the technique used to clear a gap, which could be a ditch or small creek or a slot between rocks. 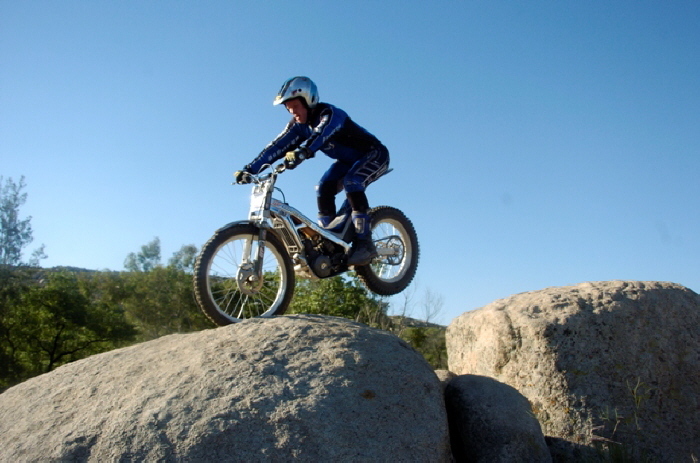 We’ll focus on gaps on level or slightly downhill terrain, in which the rider needs to clear the gap and then stop or quickly regain control on the other side (this is trials, not motocross!). The basic technique used is the bunny hop. 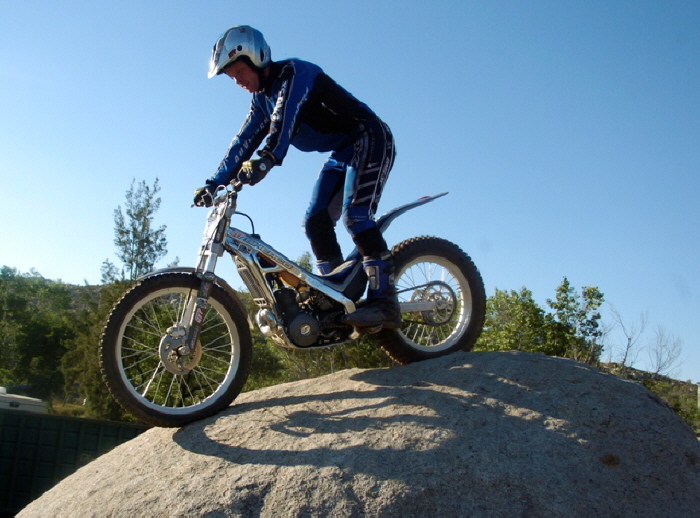 Bunny hops are also used for other purposes, for example clearing a log or other obstacle at the base of a hillclimb, but we’ll concentrate on the bunny hop over a gap for this article. 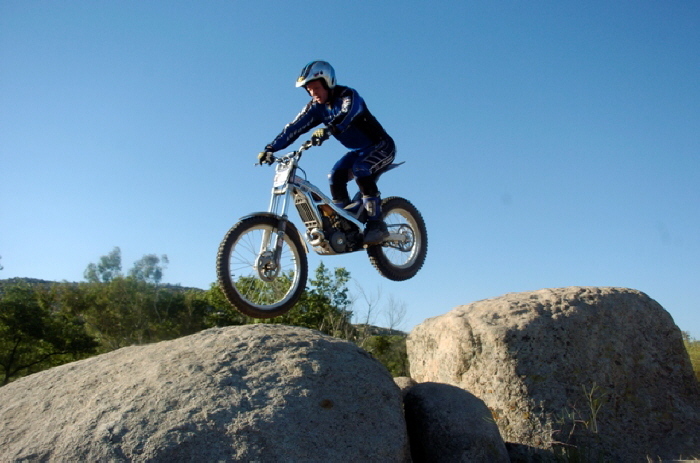 The basic idea to the bunny hop over a gap is to use the suspension and clutch along with weight shifts of your body to jump the bike toward a front wheel landing. 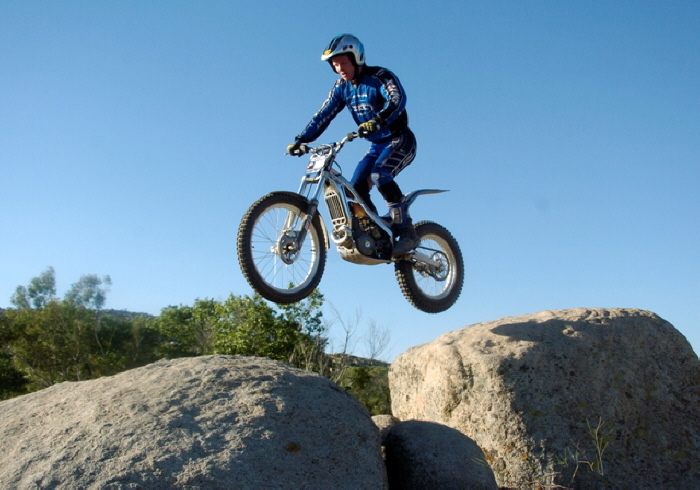 The steps to the bunny hop over a gap are described below and demonstrated by TTC instructor Bruce LeRiche in the photos. Drop your body into the middle of the bike to load both the front and rear suspension as shown in photo 1. At the same time you should be picking up the revs in the engine while slipping the clutch. Always keep your eyes focused on the point to which you will be jumping. 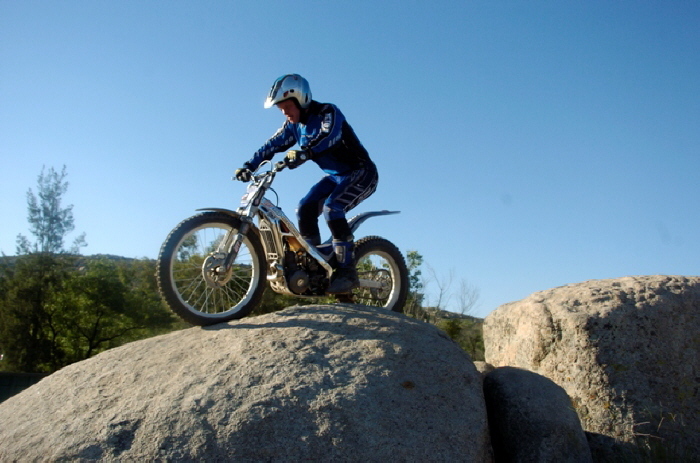 As you come out of the crouch, shift weight slightly to the rear to initiate a little wheelie (photo 2). At this point you should still be slipping the clutch, but starting to get traction and build up a little speed. 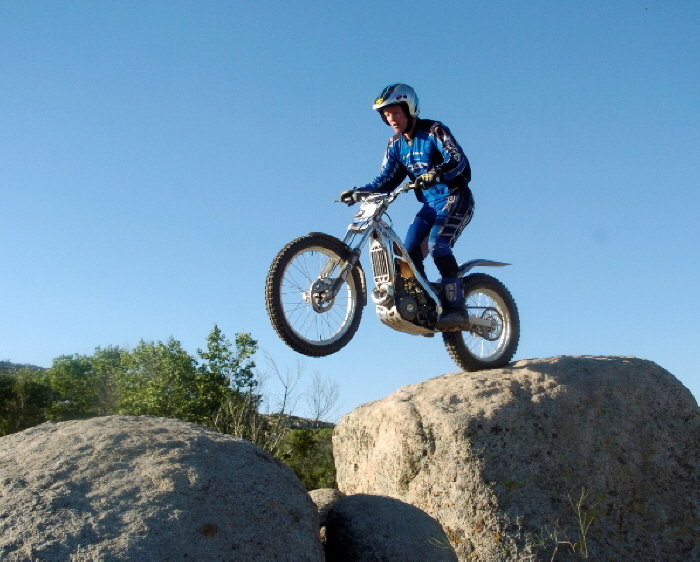 Don’t jump yet, wait until the rear wheel is as near as possible to the edge in order to make the jump shorter. 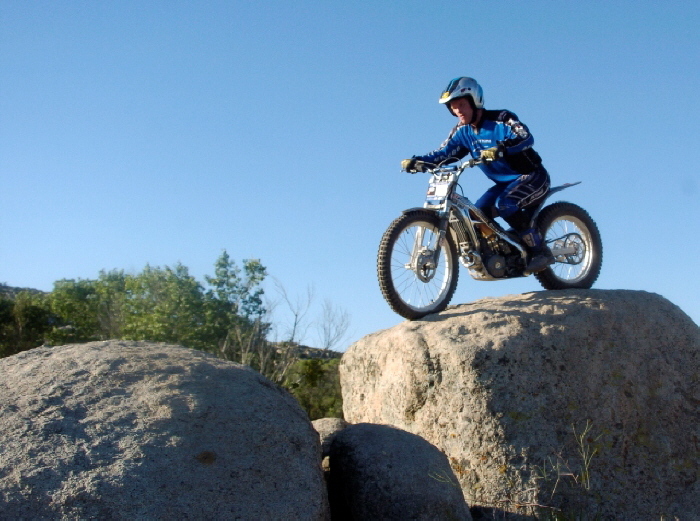 Using all the approach rock to make the gap smaller, straighten out with the legs and jump forward while you pop the clutch right at the edge. Notice in photo 3 how Bruce’s weight has shifted forward as he jumps his body over the gap (and brings the bike with him!). Extend with the arms to bring the bike forward and bend your knees to keep the rear up and clearing the jump as shown in photo 4. A common mistake is to not bend the knees adequately; if you don’t bend your knees at this point, you will tend to push the bike down when you extend your arms. At this point you should also shut off the throttle and keep your finger covering the brake. Don’t apply the brake yet, else the front could slide in mud or twist on a grippy rock. Once the front wheel lands and you feel it solid as in photo 5, start applying the brakes. Weight must be back, else the front end would be twitchy and you could even bottom the suspension. As the rear lands (photo 6), absorb impact with your legs by keeping the legs more bent. Apply the back brake while pulling in the clutch. Your eyes should now be focused on the area immediately around you for the next move such as hopping or turning. 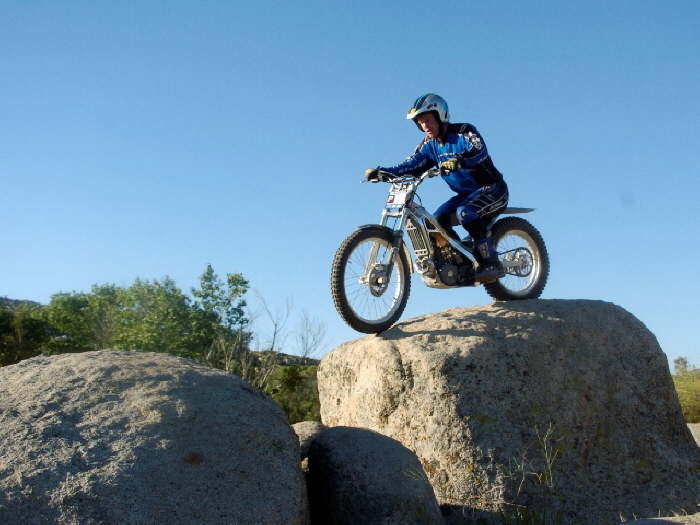 Immediately move your body position back to centered on the bike as in photo 7, and you are now stopped, balanced, and ready for whatever is next. The landing spot for the front wheel is the most important item when planning this maneuver, so that the front doesn’t slip or twist upon landing and cause a dab. 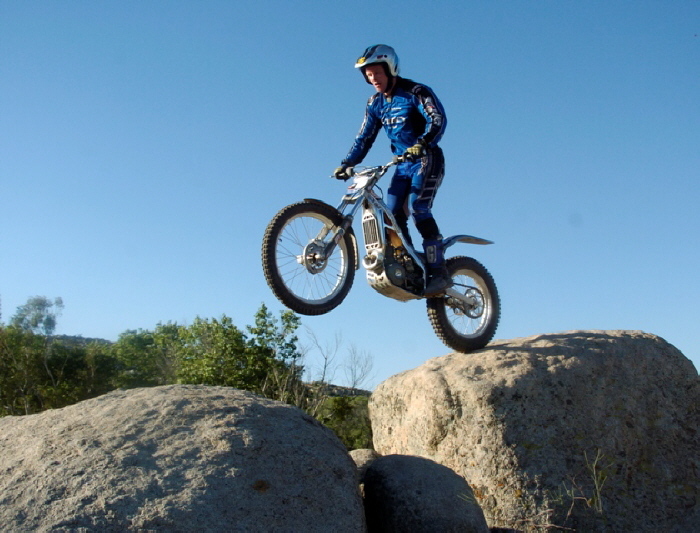 You can only develop the feel for how much throttle and jump you need by practice. The best and safest way to practice is to work on an imaginary gap on the ground or something low so that the consequences of failure are not severe. You might set out some sticks or lines in the dirt and practice safely to see that you what you can clear. As with every technique, practice makes perfect!